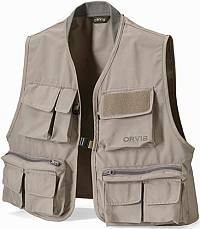 A new, updated version of the Orvis classic Clearwater Vest, still one of the best fishing vest values on the market for the diehard vest lover. Designed with 12 total pockets for ample gear storage and organization. Rear pocket is now larger and has a horizontal zipper for securing additional gear. Convenient, nylon buckle closure in front. Mini D-Rings in front for attaching accessories. Rear Tri-Ring net attachment. Soft, nylon rib-knit collar. Large fly patch for quick access to go to flies or fly drying. In stone. 65% polyester/35% cotton. Washable. 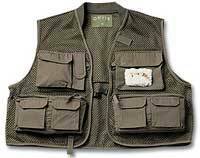  A fully adjustable vest ideally suited to year-round use. 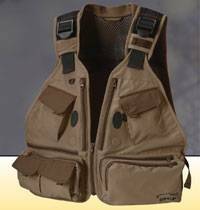  Adjustable shoulders allow a comfortable fit over anything from a tee-shirt to a heavier wading jacket.  Zinger attachment with magnetic tool anchor.  Forceps pocket with magnetic tool anchor.  Two rear mesh water-bottle and storage pockets.  Interior tippet-dispenser pocket, tool organizer.  Net D-ring, padded shoulders, breathable airmesh throughout. The new Orvis Lightweight Super Tac-L-Pak has the same fit, features, and pocket arrangment as Orvis's best-selling Super Tac-L-Pac but is 20% lighter than the original. It's constructed from a lightweight nylon to reduce weight and allow quick drying. A DWR coating helps shed water. Size L weighs 1 lb., 4 oz. In light grey. 100% nylon. Washable. !! Sizes: S(34-36), M(38-40), L(42-44), XL(46-48), XXL(50-52), XXXL(54-56), XXXXL(58-60). 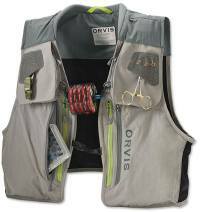 The Orvis Clearwater Mesh Vest has a breathable mesh body with the same pocket systems as the standard Clearwater Fly Fishing Vest listed below. The mesh vest comes in Olive and is washable. 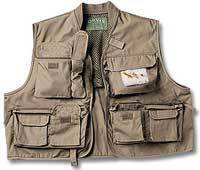 The Orvis Clearwater Fly Fishing Vest is constructed of a rugged fabric composed of 55% cotton/45% poly poplin, same as theirr Tac-L-Paks. Twelve pockets, including ample cargo pocket in the rear for extra gear, rain jacket, or lunch. Convenient, nylon buckle closure in front. D-rings for extra gear, including one in the back for net attachment. Nylon rib-knit collar. Rod-holding loop with tab. 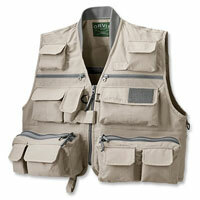 The Clearwater Vest is washable and available in Tan or Olive.